The racing was as heated as the temperature at the 2018 Interstate Championships today where the star studded New South Wales (NSW) team secured the title. With just nine points on second place it was a fight to the finish for the winning team who finished on 280, followed closely by Queensland Cyclones with 271. West Australia wrapped up the third place with a total point score of 192. It may very well have been the strategic power play used in the men’s and women’s open flag’s that paid dividends for NSW, with wins from Jake Lynch and Bree Masters earning a solid 26 points for the team. “We stacked the beach time this year and call it a power play, but it did mean we had to make our water people step up” said NSW Coach Jim Walker. Walker beamed with pride at what he called a truly united team effort by every member of the 24-strong team. 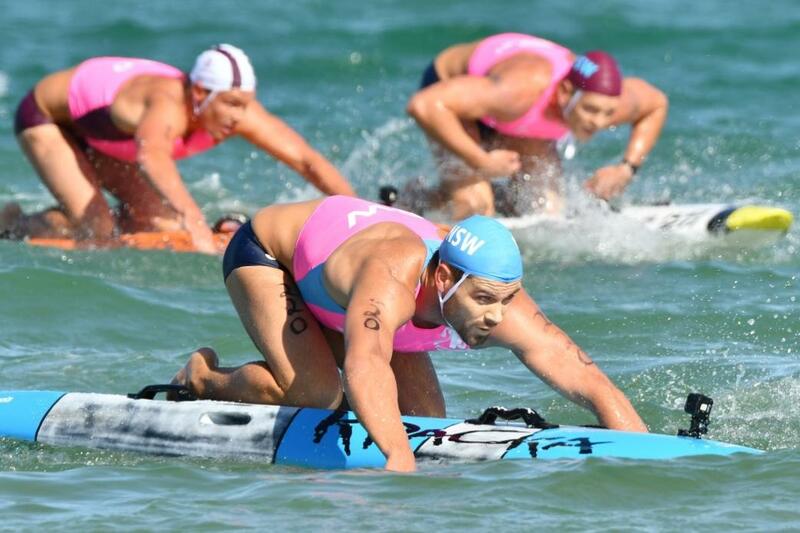 Queensland fought a gallant second, taking the final two Taplin races of the day with an impressive ski leg by Jet Kenny and stand out races across Surf and Ski. 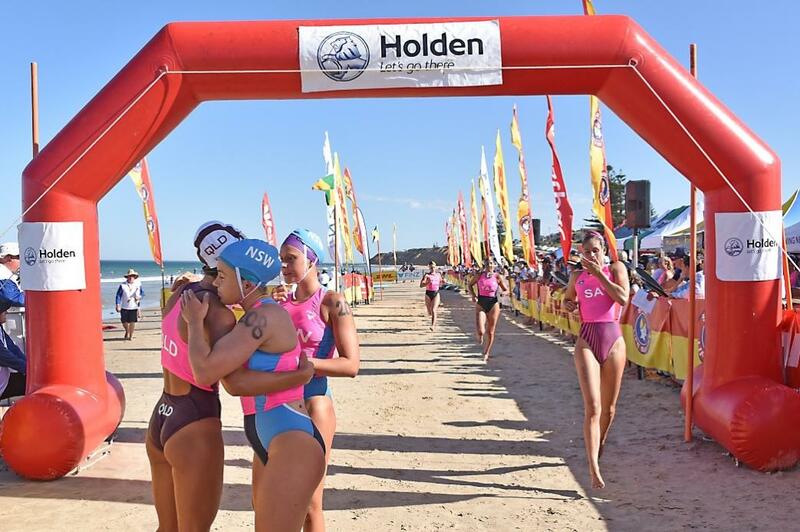 Lani Pallister and Lana Rogers shone across the day, with several winning races further cementing their reputations as two names to watch in Queensland surf sports. In team categories the youth scores finished with New South Wales (133), Queensland (120) and WA (87), while Queensland trumped in the Opens with 151 followed by NSW (147) and WA (105). Newcomers New South Wales Country took fourth in the open, tallying 88 points with a strong performance across the board. The NSW team wore pink ribbons, dedicating their win to Assistant Manager Leanne Johnson who pulled out with a week to go after a shock breast cancer diagnosis. Racing another competitor is do-or-die, but at full stop at 3.30 today Leanne Johnson is fighting a bigger fight than us so if 24 NSW athletes can help her get through her bigger challenge than our ski race or Ironman challenge, we’ll we hope we can do that for her”. Seven state teams of 24 athletes represented New South Wales, Queensland, Victoria, South Australia, Tasmanian and newcomers New South Wales Country (12) in competition today at Moana South Australia. The preparations are almost complete and now it’s a waiting game for those surf lifesavers selected to pull on the blue cap with the 2018 Interstate Challenge just a day away. After flying into the South Australian capital on Wednesday, the NSW side quickly got down to business and will undertake a final familiarisation session at Moana Beach today before resting up ahead of the major representative competition. Top of the agenda is beating Queensland and regaining the title for the first time since 2015. It’s something that the Blues are certainly keen on achieving with new captain Mitchell Trim confident that this talented team has the ability to get the job done. “We’ve got a really good quality team who are all in really good nick coming into the competition, and of course our goal is to beat the Queenslanders,” said Trim. Boasting a team with experienced campaigners such as Daniel Collins, Jemma Smith, Lizzie Welborn, and Jake Lynch it’s the potential of the youngsters which has everyone around the squad buzzing. “I think back to a couple of years ago when I was one of the youngest in the team and now to see the new athletes coming through it gives you a lot of confidence in the sport going forward,” said Mitchell Trim. There is one change to the NSW side with Blake Drysdale a late scratching after suffering an injury, and with a forecast for heat, the athletes are mentally preparing for a hard slog in the surf. “I think fitness is going to be the deciding factor. Most of us haven’t raced at the beach before which is not an issue as it’s always exciting to go to a new location. From what we’ve heard there won’t be a lot of assistance coming home so it will be a test of our endurance,” said Trim. Friday’s Championship also marks a historic first for NSW with the inaugural Country team also entering the event. Twelve lucky athletes were ultimately selected for this historic squad with athletes having to registered for a club outside the Hunter-Illawarra corridor and be an open competitor to be eligible for selection. NSW Country have been a dominant force at the biennale Trans-Tasman Series winning three successive titles including in 2017 against their rivals Northern (New Zealand) and Central Coast (NSW) Branch. Five athletes (Madeleine Baker, Luke Chaffer, Claudia Crawford, Joshua Jones, and Angus Macphail) were all part of that team that won in New Zealand last January and are looking forward to pulling on their NSW Country cap once more, and taking on the best surf lifesavers from around Australia.